MWC 2018: Samsung Galaxy S9 & S9+ unveiled @ Samsung Unpacked 2018 « Tech bytes for tea? 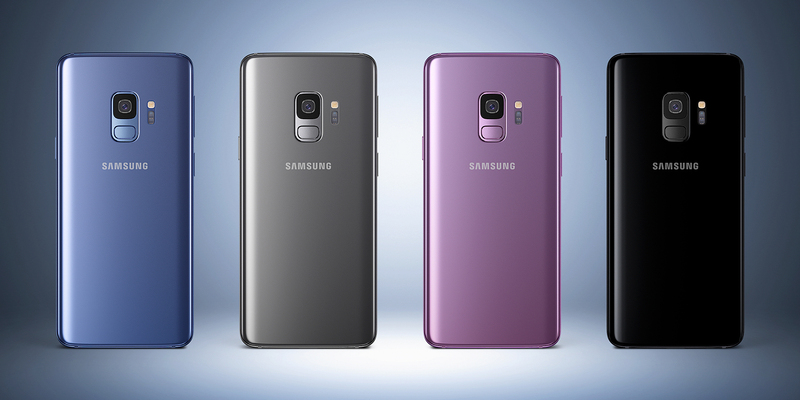 Samsung unveils Samsung Galaxy S9 & S9+ with Super Slow-mo video, dual-aperture low light camera and AR Emoji. Available from 16 March, 2018 in select markets in 4 colour choices – Midnight Black, Titanium Gray, Coral Blue and a new hue, Lilac Purple. Prices & availability below. Samsung has released the local pricing and availability in Singapore. Hands on the new Samsung Galaxy S9 and Samsung Galaxy S9+ flagship Android smartphones in Singapore. 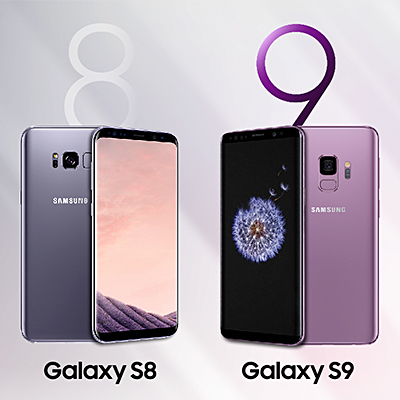 The new Samsung Galaxy S9 and Samsung Galaxy S9+ flagship Android smartphones. For the US, the direct purchase price from Samsung of a SIM-free Galaxy S9 and Galaxy S9+ will cost US$719.99 and US$839.99 respectively – local pricing for other countries are yet to be revealed. 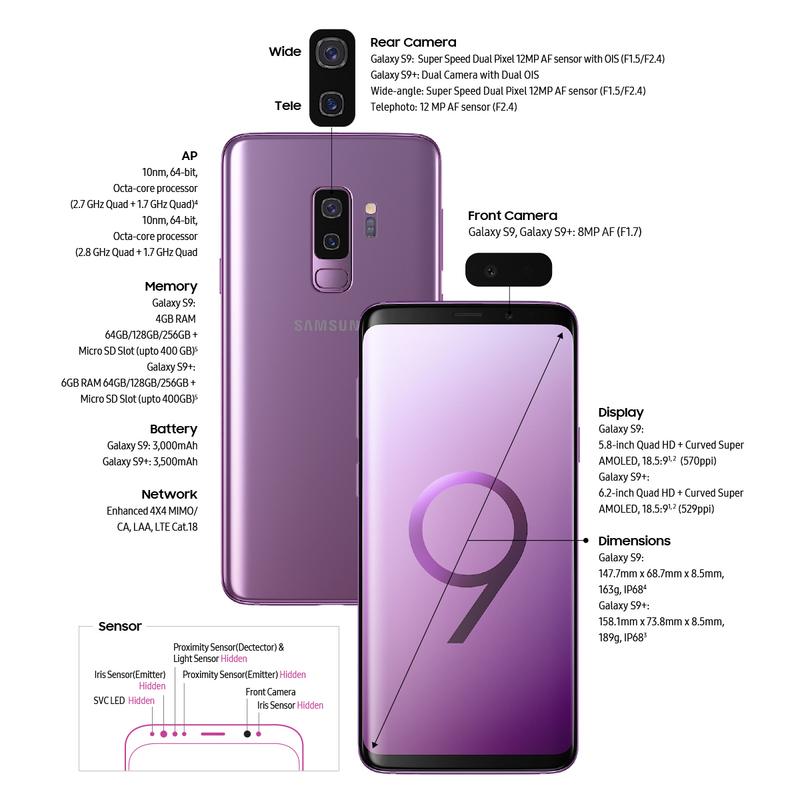 Key specs of the Samsung Galaxy S9 and Galaxy S9+. Click on image to enlarge. Samsung Electronics introduces the Samsung Galaxy S9 and S9+, the smartphones that reimagine the way people communicate, share and experience the world. Made for an age in which consumers increasingly communicate and express themselves more with images, videos and emojis, the Galaxy S9 and S9+ drive innovation with Samsung’s advanced camera. 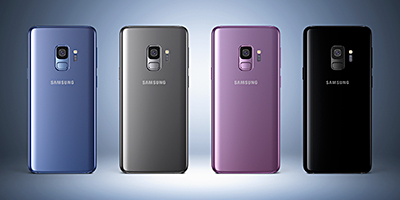 The Samsung Galaxy S9 & S9+ will be available in 4 colour choices – Midnight Black, Titanium Gray, Coral Blue and a new hue, Lilac Purple. (Galaxy S9 shown above). Redesigned with a new Dual Aperture lens that powers an innovative low light camera, Super Slow-mo video capabilities and personalized AR Emoji, the Galaxy S9 and S9+ ensure users do not miss a moment and make their everyday epic. 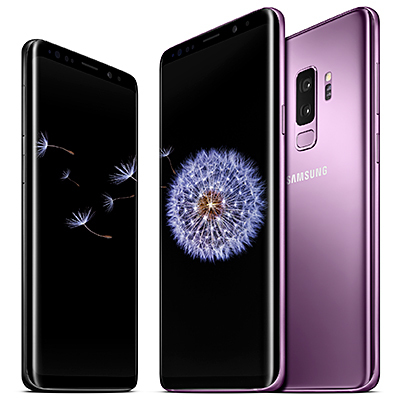 The Galaxy S9 and S9+ deliver an enhanced entertainment experience with powerful stereo speakers tuned by AKG, immersive audio with Dolby Atmos® and a refined edge-to-edge Infinity Display – a key staple in Samsung’s design heritage. In addition, the Galaxy S9 and S9+ will come with the new SmartThings app, which unites Samsung’s existing IoT services into one single, smart experience. Today’s cameras are for more than taking pictures – they’re for connecting and communicating. Consumers want a smartphone camera with state-of-the-art technology, so they can express themselves with high-quality images and tools to tell their own, unique story. The Galaxy S9 and S9+ cameras are built with these consumers in mind, with a Super Speed Dual Pixel sensor with dedicated processing power and memory to take amazing shots with high photo quality. The Galaxy S9 and S9+’s camera features include the following. Super Slow-mo: Make every day moments epic with dynamic, slow-motion video that captures 960 frames per second. The Galaxy S9 and S9+ also offer automatic Motion Detection, an intelligent feature that detects movement in the frame and automatically begins to record – all users have to do is set up the shot. After capturing the Super Slow-mo video, users can select background music from 35 different options or add a tune from their favorite playlist. Users can also easily create, edit and share GIF files with a simple tap in three playful styles of looping to watch the action over and over again. Low Light Camera: Good lighting is the secret to any great photo. But often, photos are taken in less-than-ideal lighting conditions and most smartphone cameras have a fixed aperture that can’t adjust to low or bright lighting environments resulting in grainy or washed out pictures. Similar to the way the iris of a human eye expands and contracts, Samsung’s Dual Aperture (F1.5 / F2.4) automatically lets in more light when it’s dark and less light when it’s too bright, taking photos that are crisp and clear. AR Emoji: Samsung lets users create an emoji that looks, sounds and acts like them. AR Emoji uses a data-based machine learning algorithm, which analyzes a 2D image of the user and maps out more than 100 facial features to create a 3D model that reflects and imitates expressions, like winks and nods, for true personalization. AR Emoji shares users’ real-life emotions not only in video but also with a range of stickers and uses a standard AGIF file format so users can share their emojis across most third-party messaging platforms. Bixby: Samsung’s intelligence platform, integrated into the camera, uses augmented reality and deep learning technologies to provide helpful information about a user’s surroundings. With real-time object detection and recognition, Bixby instantly generates information directly on top of the image that the camera is pointing at. Users can translate foreign languages and currency in real time with Live Translation, learn about their surroundings, purchase products seen in the real world and track calories throughout the day. Appearance wise, the new Samsung Galaxy S9 and S9+ looks very similar to their predecessors. Click on the photo to see the differences between the Galaxy S9 and the Galaxy S8. Smartphones are often our go-to choice for entertainment, which is why Samsung created a device that offers premium sound experiences with stereo speakers tuned by AKG. Whether users are watching their favorite movie or streaming their favorite artist’s latest album, sounds are clear, crisp and rich in quality. The Galaxy S9 and S9+ also support Dolby Atmos, giving the effect of 360-degree sound. The Galaxy S9 and S9+ audio experience is complemented by Samsung’s revolutionary Infinity Display. First introduced on the Galaxy S8, the bold, bright Super AMOLED Infinity Display blends right into the phone with virtually no distracting notches. With adaptive contrast enhancement, users can use their device even in direct sunlight. As the first smartphone to support the new SmartThings app, the Galaxy S9 and S9+ are the central hub to manage every facet of the connected lifestyle at home, at the office or on the go. The SmartThings app will be introduced with the Galaxy S9 and S9+ and will connect to other Samsung and non-Samsung devices. For those constantly on the move, the next-generation Samsung DeX empowers a mobile lifestyle by bringing a large, full-screen experience to the mobile handset. With the DeX Pad, a new docking system, users can easily connect the Galaxy S9 and S9+ to a larger monitor, keyboard and mouse to expand the mobile experience with enhanced document editing or even full-screen gaming. Users can also transform the Galaxy S9 and S9+ into a Touch Pad with the DeX Pad. Samsung sets the gold standard for smartphones with IP68 water and dust resistance and wireless charging and goes a step beyond with the Galaxy S9 and S9+. The devices now support expandable memory of up to 400GB with a Micro SD Card and are equipped with the latest premium application processors offering powerful performance and sophisticated image processing. “The way we use our smartphones has changed as communication and self-expression has evolved. With the Galaxy S9 and S9+, we have reimagined the smartphone camera. Not only do the Galaxy S9 and S9+ enable consumers to shoot great photos and videos anywhere, it’s a smartphone that’s designed to help them connect to others and express themselves in a way that’s unique and personal to them,” said DJ Koh, president and Head of IT & Mobile Communications Division, Samsung Electronics. In addition, the Galaxy S9 and S9+ give users the peace of mind knowing that their phone is protected by Knox 3.1, Samsung’s latest defense-grade security platform. The Galaxy S9 and S9+ support three different biometric authentication options – iris, fingerprint, and facial recognition – so users can choose the way they want to protect their device and applications. The devices feature Intelligent Scan, a new verification that intelligently uses the collective strength of iris scanning and facial recognition technology to quickly and conveniently unlock a user’s phone in various situations. The Galaxy S9 and S9+ also introduce Dedicated Fingerprint, giving users the option to use a different fingerprint to access Secure Folder than the one used to unlock the phone. The Galaxy S9 and S9+ take health to the next level with an improved optical sensor built directly into the device, providing richer, more accurate information on users’ health status. This sensor allows the Galaxy S9 and S9+ to keep track of users’ Heart Load Factor, a new measurement of the real-time demand placed on the heart. This entry was posted on Monday, February 26th, 2018 at 3:23 am and is filed under Android, Announce, Gadgets, gadgets, GALAXY, Launch, newArrivals, Press Release, Prices, Samsung, smartphones, Specifications. You can follow any responses to this entry through the RSS 2.0 feed. You can leave a response, or trackback from your own site.